Especially if you just moved into a house, you may want to replace the flooring. Hardwood flooring can be scratched, carpeting dirty and worn, or laminate chipped and stained. When replacing the flooring in your home, it’s important to consider several things to ensure you’ve made the best choices. Let’s go through some of them now! Have you ever been in a home that’s all carpet? It makes it hard to differentiate one room from the next and doesn’t lend any personality to the house. There are many flooring options to choose from, and they work well with each other. Choosing the best flooring for each room is key. How often does the room get used and what does it get used for? Kitchens, for instance, have a lot of foot traffic and there will likely be many food and drink spills – flooring like tile or laminate may be best. For hallways and stairs, an engineered hardwood can reduce the wear and tear. Which flooring you choose depends quite a bit on the look and feel you want your home to have. Leaning towards comfortable and cozy? A combination of carpet and tile could do the trick. Looking for a more modern appeal? Mixing engineered wood with concrete flooring is futuristic and fun. These days, engineered wood, tile and carpet come in so many shapes, colors and sizes that the sky is truly the limit. And of course, the price of your flooring matters too. Carpet and laminate are less expensive to purchase and install than other flooring, like hardwood or tile. That being said, both of these materials aren’t as durable so they may need to be replaced more often. Spending a bit more up front on materials like engineered wood may mean that they stay looking good and last for the lifetime of your home. Finally, your comfort is key. If you spend a lot of time lounging in your living room, you may want to pick a plush carpet. If your living room is mostly for entertaining guests, an engineered hardwood might be best to withstand shoes and spills. Another example is your bedroom – do you use the bedroom mostly for sleeping, or do you have a desk in there? 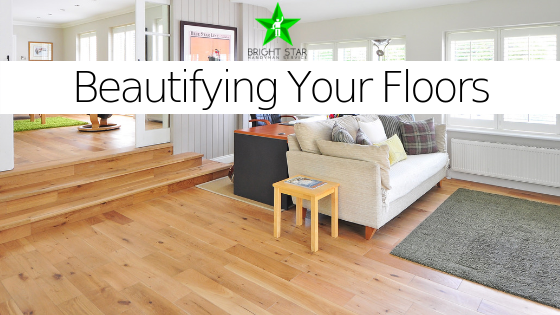 Again, your flooring type depends on your use of the room – choose wisely! Need a hand choosing the best flooring? We can help! Give Bright Star Handyman Service a call today.